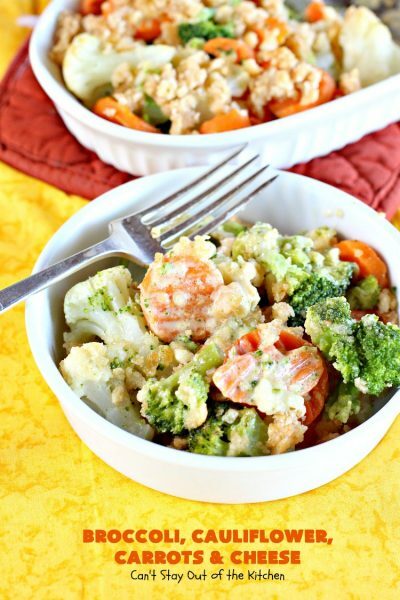 Broccoli, Cauliflower, Carrots and Cheese is a delicious, comforting vegetable casserole that’s easy to fix and as tasty as it gets. 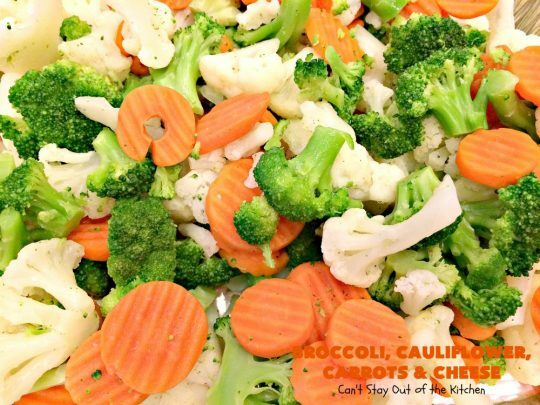 I’ve made it with broccoli, cauliflower and carrots, or other vegetable medleys like mixed vegetables, stir-fry medleys, even peas and carrots. I’ve also used plain saltine crackers and butter for the topping when I ran out of Ritz crackers…although the buttery flavor from Ritz crackers is far superior. If you don’t like using velveeta, substitute a mild cheddar cheese. I got this recipe back in the early 1980s from Harriett Brown, the wife of our Sunday school teacher at Indian Rocks Baptist Church. Harriett was a fabulous cook and I have probably close to ten of her recipes in my cookbook. Many of which I still use on a regular basis. This is one of them. I think Harriett probably created this recipe. Back in Largo, this recipe was one of a dinner menu collection I had submitted to the St. Petersburg Times that won recognition back in the late 80s. This is just a great casserole for holidays or when you’re having company. You can prepare it ahead of time and then pop it into the oven when you’re ready to bake it. 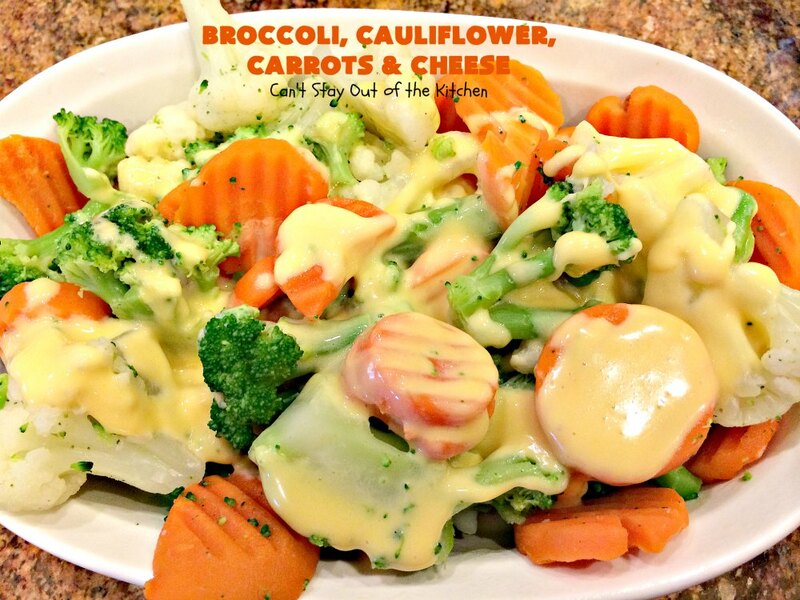 The marvelous Velveeta cheese sauce is what makes this casserole so special. 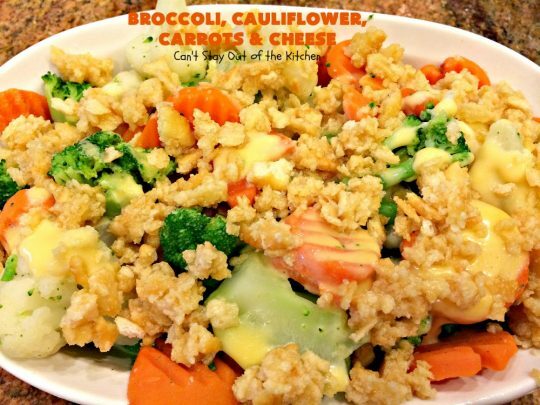 If you’re looking for a satisfying side dish for any get-together, than Broccoli, Cauliflower, Carrots and Cheese should be on your menu. Every time I’ve served this recipe, our guests always come back for seconds. 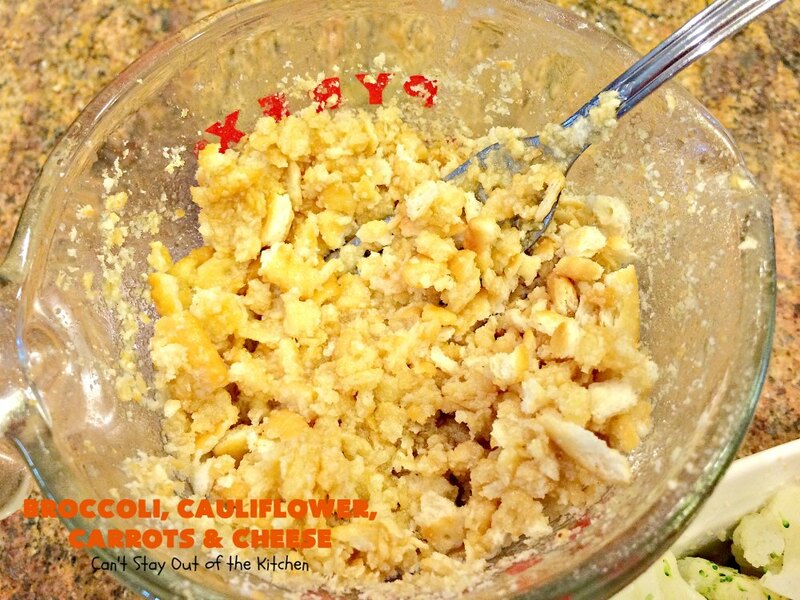 I first posted this recipe in July 2012 in the early days of food blogging. My pictures were on colored plates (a no-no in food photography), and I put so many Ritz cracker crumbs on top that you couldn’t really see the veggies underneath. Not to mention my pictures were just bad! Broccoli, Cauliflower, Carrots and Cheese is an utterly scrumptious side dish! Every bite of Broccoli, Cauliflower, Carrots and Cheese is succulent and amazing! Here’s what the casserole looked like after I took it out of the oven. 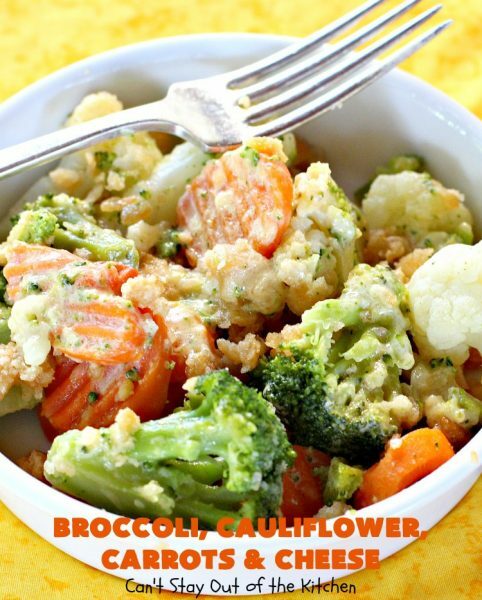 Partially cook two pounds of Broccoli, Cauliflower and Carrots in the microwave about seven minutes for each pound. Place in greased baking dish. 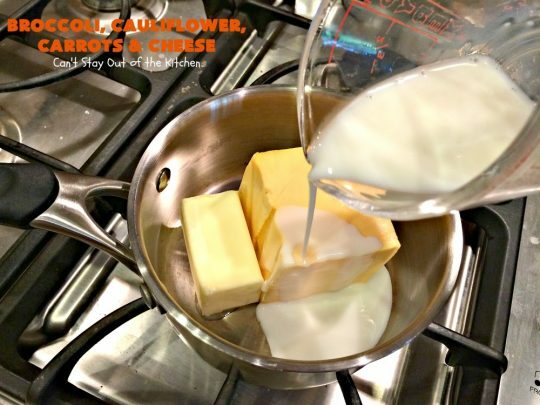 Make a sauce with a slab of velveeta cheese, a few tablespoonfuls of butter and about 1/8-1/4 cup milk. Melt over low heat (don’t use a higher heat as this will scorch easily) until cheese is no longer lumpy. Pour sauce ingredients over vegetables. 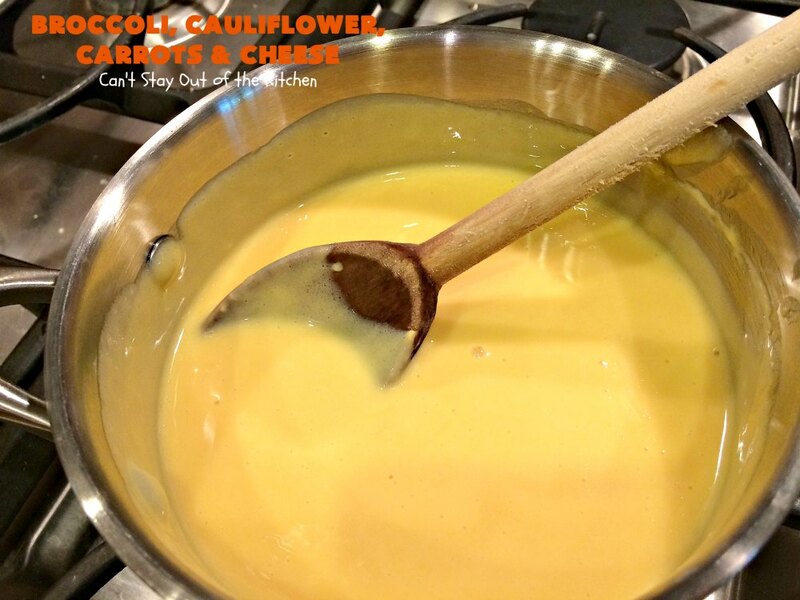 Then I usually take a wooden spoon and poke the cheese sauce down to the bottom of the casserole in several spaces so it thoroughly coats the vegetables and doesn’t just lay on top. 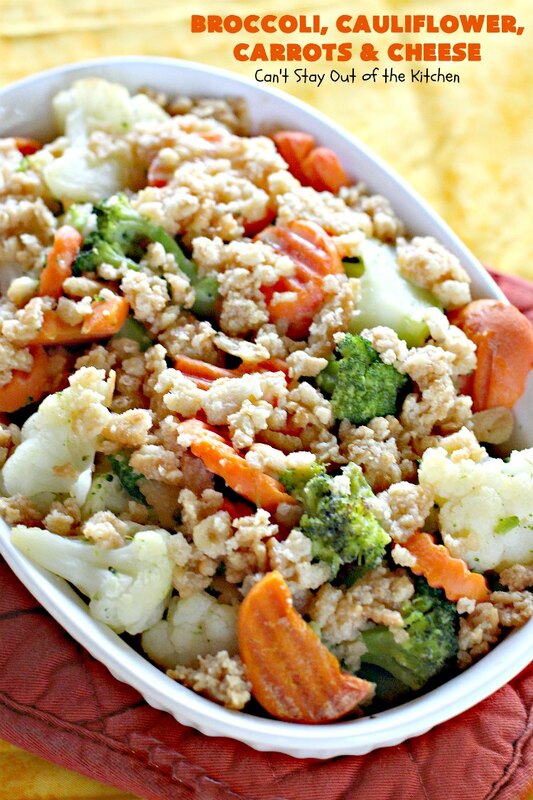 (You can also make this with frozen veggies). This is what you’ll need for the topping: 1 stick of melted butter and 1 sleeve of Ritz crackers. I crush the crackers in my hands. It takes all of about 1 minute. Then add them to the melted butter. Stir to combine. Spread over top of vegetables, and bake at 350 about 30 minutes. 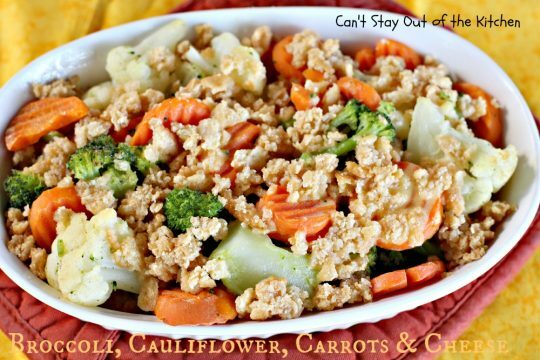 If you use frozen veggies you will need to cook these about 1 hour. If crackers are getting too brown, cover with foil. Here the casserole is just out of the oven and ready to serve! We have served Broccoli, Cauliflower, Carrots and Cheese for company countless times. Everyone always enjoys it. Broccoli, Cauliflower, Carrots and Cheese is so easy to make. 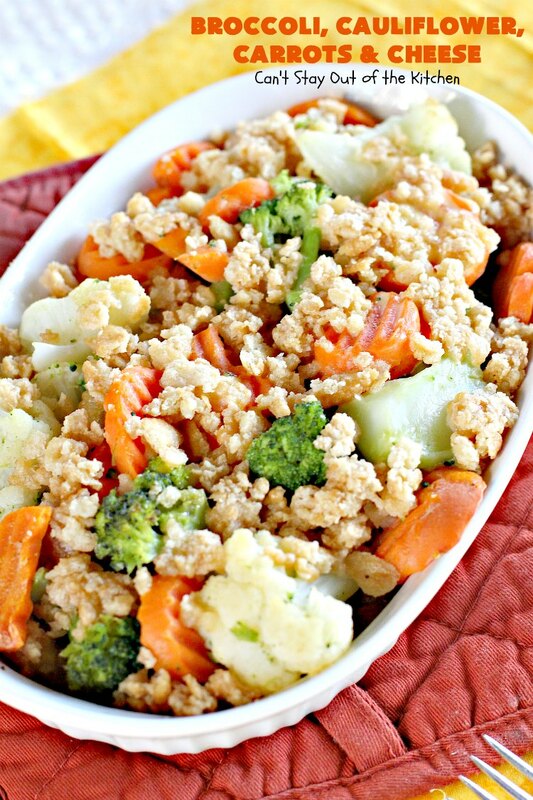 That makes it the perfect side dish for holidays like Mother’s Day, Father’s Day or Easter. 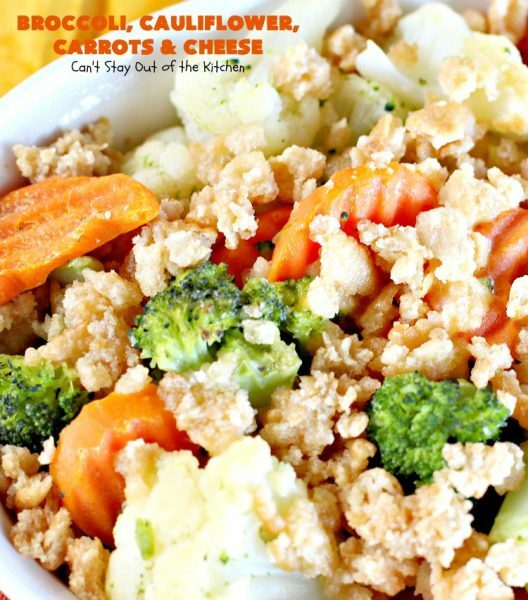 This amazing casserole features broccoli, cauliflower and carrots in a creamy Velveeta cheese sauce and topped with a sprinkle of Ritz cracker crumbs. Great holiday side dish. Place cooked veggies in bottom of a greased 9x13" baking dish. Melt cheese, 4 tbsp. butter and milk in small saucepan over low heat. Stir and pour over veggies. Combine crackers and melted butter. Bake in 350° oven for about 30 minutes until heated through. NOTE: I usually microwave each pound of veggies for about 7 minutes--not the full 10 minutes according to package directions. NOTE: Cheddar Cheese can be substituted for Velveeta cheese. 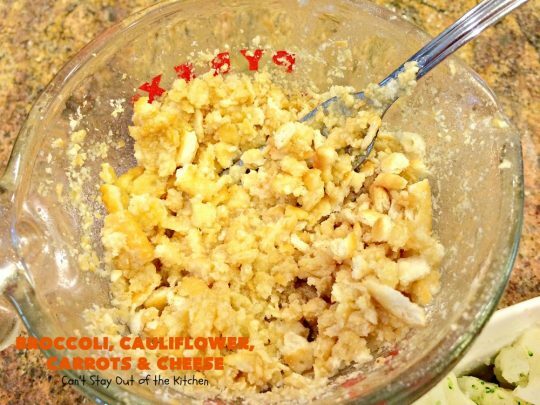 NOTE: You can also put frozen veggies into a greased baking dish. Cook covered at 350 for 30 minutes. Remove foil and bake an additional 30 minutes or so or until veggies are fork tender. NOTE: Be careful to slowly melt the cheese over low heat as Velveeta will scorch easily if the heat is too high. Place cooked veggies in bottom of a greased 9×13″ baking dish. Melt cheese, butter and milk in small saucepan over low heat. I usually microwave each pound of veggies for about 7 minutes–not the full 10 minutes according to package directions. [br][br]Cheddar Cheese can be substituted for Velveeta cheese. [br][br]You can also put frozen veggies into a greased baking dish. Cook covered at 350 for 30 minutes. Remove foil and bake an additional 30 minutes or so or until veggies are fork tender. [br][br]Be careful to slowly melt the cheese over low heat as Velveeta will scorch easily if the heat is too high. This close up shows you the texture of the veggies. 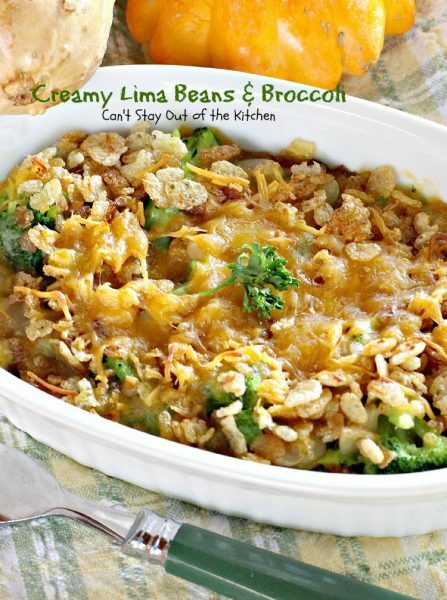 Your mouth will be watering as you enjoy this tasty recipe! 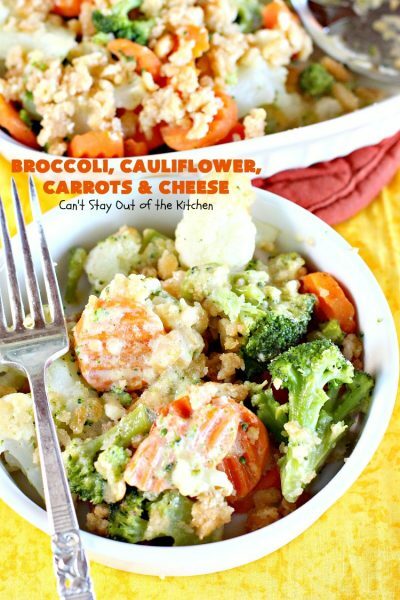 Tried the Broccoli, Cauliflower, Carrot recipe and it was yummy! I’m so glad! we love this recipe. It’s easy and delicious! Sorry, about that June. One stick of butter is 8 tablespoons or 1/2 cup of butter. When I say a “slab” it means I don’t measure it. I cut off a one or two inch slab off the velveeta which is about a 3-inch cube rectangle. If I was to measure it it would probably be in the range of 1/2 cup or so of cheese once it melts down. But this is one of those recipes that you can’t goof up. A little more or little less is okay. I would err on the side of more cheese rather than less, personally speaking. If you can’t find velveeta there just use about a cup of sharp cheddar cheese. That should do the trick. Thanks for stopping by.